It sounds bleak. 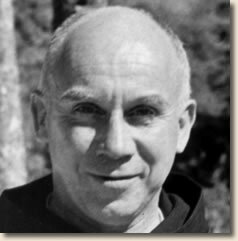 Trappist monk, who received his novitiate training under Thomas Merton, makes his calling and his mentor Merton’s calling sound like an exile in the desert—going beyond comfort and hope, in which “the self and its sense of well-being, or lack thereof, is incidental.” The strange thing is that Brother Paul is a prolific writer and by many accounts a wonderful, happy, engaged human being—and so was his famous mentor. Or as I have thought of it far more folksy, slangy terms: “sometimes God likes to get us alone.” I have been in a few deserts in the course of my life, most of us have—stretches of life not going according to plan, times of not knowing what would come. These stretches can lead to a very intimate contact with your life–this naked contact is essential to a truly creative life. The word contemplation comes from the Latin word contemplatio. Its root is also that of the Latin word templum, a piece of ground consecrated for the taking of auspices, or a building for worship, derived either from Proto-Indo-European base *tem- “to cut”, and so a “place reserved or cut out” or from the Proto-Indo-European base *temp- “to stretch”, and thus referring to a cleared space in front of an altar. The Latin word contemplatio was used to translate the Greek word θεωρία (theoria). Life can be like this: Just when we’ve given up hope of finding a way out of the desert we may come upon a spring. Just when you have accepted that scorn of the world or your parents or mentors—just when you are too parched and tired to care about anybody’s judgments, you may find a deep well. It happens at the point when you go beyond all the noise—let them call you a lunatic, a bum, an extra and thoroughly unwanted human who doesn’t pull her weight, someone too impractical, artistic, mystical, unrealistic (you may add your favorite salt to the wound of being you). It happens when you stop needing assurances and praise. You will sink into a stillness below the words, and remember the simple vibrant, naked sense of being alive. And then you may find the source, the wellspring. No one knew to tell you it was there—no one knew. No one but God, and now you. There is being a success, and then living successfully. I know a lot of people who are living successfully, abundantly even, in family, in friendships, in relationships at many different levels. Christ once said something like; I came that you might have life, and have it more abudantly. So, what is living an abundant life? I think that it is a life of sharing and serving, of being and letting go. The opportunity to do that is presented to us everyday in the relationships we have with others. It’s right in front of us everday. Now, that’s something to wake up to everyday of our abundant lives. When we can see and appreciate the mystery of this at work in our lives clearly, when we can reach that clarity, then we have reached nirvana. Don’t you think so too Tracy? I agree with you, Ron. And I also think we are living in a time when success is beginning to be radically reinterpreted by many people (not just old hippies, like me). More people are turning away from success-as-consumption–success-at-any-price to an appreciation of the impact we are having on the earth and on each other. I see this happening, don’t you? The idea of our interdependence–and the notion of living in connection–is not so far fetched…not just for monks and poets. Don’t you think so? May it be so. Lovely piece, thank you. I believe the “more abundantly” that Christ speaks of is the greater expression of the Christ within our beings. He demonstrated the way..”I Am the way, truth and the life. I tried to think of this film yesterday and had a senior moment, although if 60 is the new 40, perhaps I’m in better shape than I imagine. In the film I AM, film maker Tom Shadyac look’s at what is wrong with the world. However, in the process of trying to figure out what’s wrong he discovered there’s more right than he ever imagined. “He learned that the heart, not the brain, may be man’s primary organ of intelligence, and that human consciousness and emotions can actually affect the physical world, a point Shadyac makes with great humor by demonstrating the impact of his feelings on a bowl of yogurt. And, as Shadyac’s own story illustrates, money is not a pathway to happiness. In fact, he even learns that in some native cultures, gross materialism is equated with insanity. Ultimately, the source we are looking for is the divine connection or interconnection within us all, found in relationship with one another and the world, with all of creation. We need to make a major paradigm shift in how we think about one another and how we think the world works, of course this is what Christ and the Buddha taught and offered, a new way of thinking. If you would like to learn more about the film, here is a link. When you look at institutions that are good at forming a specific vision and mission, think of nonprofits, you can see how their definition of success is completely different from others, placing value on our many interconnections. By staying focused on what they wish to do, and executing it well, they find success through serving others. They offer something of great value to the society and culture in which they dwell. Parabola is a great example. I could name many others. In Christianity, there is a remarkably similar and beautiful concept, it is found in a marvelous Greek word used by the early church fathers and mothers, to describe the mystery of the Trinity. It is the word, Perichoresis (peri-kor-es-is). Perichoresis is an ancient term in Christian theology, which refers to the indwelling of the Trinity, of how the Father, Son, and Holy Spirit are so intimately connected within their unity as one that there is an indwelling between them all. And that this indwelling is shared in and through Christ, in the Paschal Mystery of Christ as the Incarnate Word, the Word Made Flesh. Christians see the mystery of the Holy Spirit, the Divine Presence, dwelling within us all, interconnecting and binding us together with one another. We find it in relationship with on another, within creation, within the divine energies of creation and the divine love of creation that sustains us all. When we awaken and realize this truth, this way, this light; then embracing an abundant life becomes much easier. Indeed, we are called to live such a life in all its abundance. Peace. Thanks, Mary Ann. I agree. This is why I have such a high regard for Simone Weil. I believe through her I’ve have the experienced of the evolved female heart which men such as me are very appreciative of. The expressions of her heart were not a result of what Gurdjieff called internal considering but just having “awakened” to reality. Her heart gave her the force to pursue freedom from Plato’s cave. Her mind had made her aware of her psychological prison and her purity of heart allowed her to sacrifice the “goods” of Plato’s cave for the sake of freedom from it. Purity of heart provided emotional recognition of levels of reality and the evolutionary drive to leave the lower for the experience of the higher. Plato taught the relationship between the world of forms or of knowledge as that which is the source of our phenomenal world of opinions. Simone “felt” the need to transcend the world of opinions so as to experience the world of knowledge or the source of opinions. Her need wasn’t for success within Plato’s cave but the conscious truths revealed through becoming free of its restrictions that provide the experience of objective human meaning and purpose. Weil, Simone, An Anthology, ed. Sian Miles, London: Penguin Books, 2005. No hearts and flowers or “we are all one” here that serve to glorify the cave. Just a purity of heart that recognizes the human condition and the inner direction towards freedom that enables the knowledge of the mind together with the whole of oneself to lead to objective truth within the world of forms that transcends the world of opinions we are attached to through identification which in turn denies its truths. Thanks, Nick. May we all dare to really enter life, not just think about it, as Simone did. May we all have nonconformist hearts. I like your poem; I hope all is well Betty. Life is going very well, and I am glad you are a part of it!